Stampede kicked off its 2018 Big Book of AV Tour in the Chicago suburb of Lincolnshire, IL, on March 8. Local #AVTweeps gathered for the daylong conference designed to provide industry insights, technology updates, and training forums. The Samsung Flip allows real-time collaboration and sharing across devices. Vendors were more than ready to add value with their latest and greatest products on display. The Samsung Demo Room showcased some of the company’s technology like the Samsung Flip WM55H, a digital flipchart display. Designed to promote a more collaborative digital engagement, users can “write” on the transportable display with their fingers or a dual-sided pen (included); users can also connect to the Flip with their own PCs, smartphones, and tablets to share content. When the meeting ends, content can be stored in the device with a password-based protection system ensuring complete confidentially. New to the Big Book of AV Tour is LED display manufacturer Lighthouse. “We recently launched a distribution partnership with Stampede focusing on our new dynamic flat panel-style LED displays,” explained Ed Whitaker, the company’s general manager in the Americas. On the show floor, the company was displaying its 89-inch Dynamic All-in-One LED Display. The display, which can be wall mounted, hung, or floor standing, comes with a built-in media player, and ships with spare panels. “We’re excited to be a part of the Big Book of AV because it gives us the chance to meet with potential new customers. It also gives us a chance to speak about some of our large installations—like the Spartan Stadium in Michigan, and the American Airlines Center in Dallas, TX,” said Whitaker. 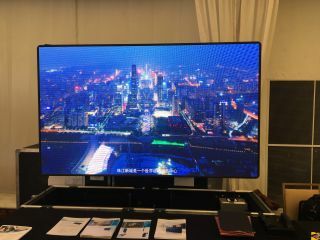 Lighthouse’s 89-inch Dynamic All-in-One LED Display is a plug-and-play systems ready for Wi-Fi, USB, LAN, and cloud connections. Optoma was showing off multiple projection solutions, but its most popular product was the ZU1050 laser projector with 10,000 lumens. Designed for large meeting rooms, auditoriums, museums, and the like, one of the projector’s most prevalent features is that it has interchangeable optical lens options to ensure customizability for each customer. ONELAN, another newer member to the Stampede alliance, was talking about its various solutions for digital signage including enterprise-level content, network and device management software, and the Reserva room booking solutions. The company aligned with Stampede in July 2017, and promised to provide coaching to integrators who are new to the world of digital signage, according to Irene Chow, VP channel sales North America at ONELAN.